With Mayo playing against the Sky Blues on Saturday night there was a somewhat congested Mayo League card on Sunday afternoon. Westport Utd recorded a facile 6-0 win at home to their former fierce rivals Castlebar Celtic on Sunday morning. Dave Hoban fired home four goals in a stunning display, as well as efforts by Phil Keegan and Darren Browne in a superb display by the Covies. Ballina Town were made work for their three points at home to Conn Rangers. A first half Brendan Lavelle strike ultimately proved the difference in a closely fought affair. Ballyheane were comprehensive 4-0 winners against Charlestown Athletic at the weekend. Two goals apiece from Arek Tobiasz and Dan Purcell were enough for Ballyheane, as they consigned Charlestown to another gut-wrenching defeat. 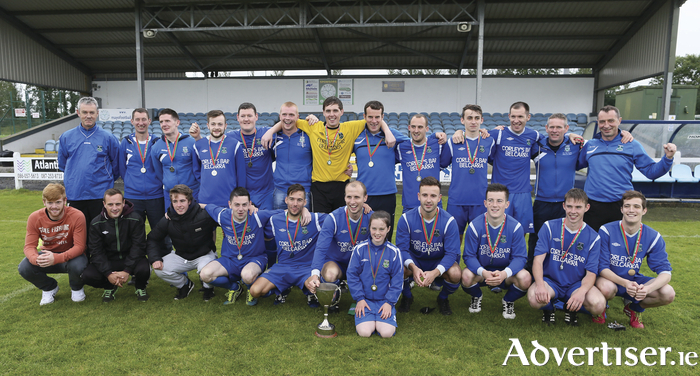 Iorrais Aontaithe put their Westaro Cup final defeat behind them thanks to a 3-1 win over Straide and Foxford in a fully assured display. Iorrais led 2-0 at the break and were in cruise control with Brendan Nallen and Jason Boylan on target. Ivan Barrett sealed the deal before Straide and Foxford added a late consolation goal as Micheal Smyth slotted a 92nd minute penalty. Manulla came from behind to see off a gallant Ballyglass side on Sunday afternoon in a game that wasn’t for the faint-hearted. Liam Hughes gave Ballyglass a 38th minute opener which was very much against the run of play after Manulla dominated the opening exchanges. Tom Healy’s men regrouped and two goals in quick succession by Gary Concannon and Bryan Ralph was enough to see them over the line. Both Claremorris and Glenhest Rovers maintained their push for promotion with both sides recording wins on Sunday. Claremorris who pushed Westport’s A side so close in the Connacht Gold Super Cup last four clash, recorded a 3-1 win away to Westport Utd B thanks to goals from David Grant, Dean Roddy and Oisin Brady. Glenhest Rovers were pushed all the way by Castlebar Celtic B and needed to dig deep to fashion a 1-0 win away from home. A first half Pat Mulchrone goal proved hugely decisive. Partry Athletic bagged three points on Sunday afternoon after a 2-0 win in rather fortunate circumstances as two own goals made the difference. First Andy Leadbetter headed into his own goal and then Keith Cassidy diverted the ball into his own net and it is a cruel blow to any hopes they had of promotion. Swinford put Moy Villa to the sword with a 10-0 win at home, as Richard Dalton bagged a hat-trick, along with braces from Neil Fallon and Ian Price as well as efforts by Chris Reddington, Sean Kenny and Niall Price. Fahy Rovers recorded a new Mayo League record on Sunday as it only took 22 seconds to break the deadlock against Killala. Finbar O’Mara, Shane Groden and Johnathan Beckett all bagged braces along with an effort from Tommy Gill in a 7-1 win away from home. Newport Town defeated Ballinrobe Town 1-0 in a hugely competitive affair on Sunday afternoon with a Kevin Noonan goal proving decisive. Achill Rovers recorded a comfortable 3-0 win at home to high-flying Conn Rangers B with Terence Dever and Kevin Lynch among the goals. Mulranny Utd were pushed all the way by Snugboro United in a thrilling contest. Mulranny found something special in a 6-4 win with the goals coming from Adrian Grealish (two ), Wesley Patten, Conan Dyer, Shane McManamon and Mikey Gallagher. Ballyhaunis Town were awarded the points as Manulla B were unable to field a team at the weekend. Crossmolina were pushed all the way by a gallant Fahy Rovers B outfit with the North Mayo men clinging onto a 4-3 win with super sub James Mulligan nailing a 92nd minute winner. Goals from Mark Rothwell, Ciaran Traynor and Shane Gravaghan had given Crossmolina a 3-1 cushion at the break, with Joey Smyth on target for Fahy Rovers. Fahy Rovers pulled back level courtesy of goals from Smyth again and an unfortunate own goal, but Crossmolina had the last laugh. Ballina Town B remain hot on Crossmolina’s heels as they recorded a comprehensive 8-0 win at home to Charlestown Athletic B. Both Shane Devers and Lee Corcoran nailed hat-tricks along with strikes from Stephen Melvin and Gavin Cording. Ballyglass B also recorded a stunning 9-1 win at home to Snugboro United B with a flurry of goals by John van den Oosten (two ), David Clarke (two ), Dylan Hughes (two ), Scott Hamilton, Mick Plunkett and John Walsh. Kilmore bagged a comprehensive 13-0 win away to struggling Hollister on Sunday afternoon. Kiltimagh/Knock Utd B had to dig deep to see off Ballyvary Blue Bombers in a 2-1 win away from home.